Haifa Port is Israel's main passenger ship port handling both cruise and ferry line traffic at the newly expanded cruise terminal. The 5,500 sq meter facility has a cafeteria, currency changer, parking facilities, and a bus terminal for excursion groups. A large duty-free shopping facility and international telecommunications center with free WiFi. The train station is only a two minute walk from the cruise terminal where you can catch the train into Tel Aviv. Car rentals can also be arranged. Depending on where you are docked, a shuttle will be in place to get you to the cruise terminal. You will be docked close to the center of the city, a 15 minute walk. Be aware: Haifa is a hilly town. Most cruise passengers skip Haifa and opt for the two- three hour drive to Jerusalem or Bethlehem. Still, Haifa has some sights that are worth exploring. Due to time restraints most cruisers opt for a ship organized excursion. It's a nice sized city built on hills (it's often called the Middle East 'San Francisco'). 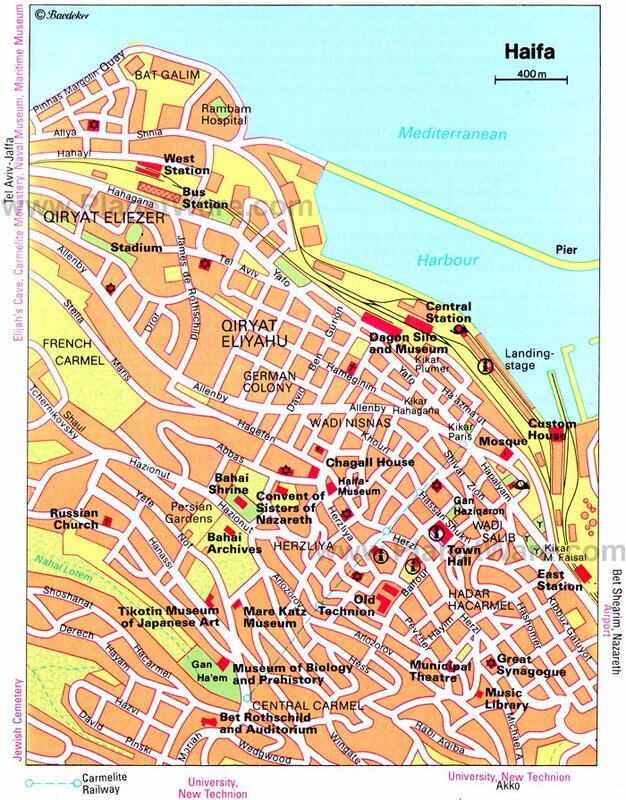 Haifa is home to significant populations of Jews, Muslim and Christian Arabs, Ahmadis (in Kababir), Druze (in Daliyat al-Carmel), Bahá'ís, and others, and has often been characterised as a mosaic of peaceful coexistence between the communities. The green Carmel, blue sea and the golden sand at the beach front. A modern harbor and remarkable beaches. Breathtaking landscape of the Haifa Bay area and Bahá'í Gardens, and the Carmel National Park. Mount Carmel has always been linked with abundance and fertility, as indicated in the meaning of its original name "kerem" (vineyard). Mount Carmel, sacred to Jews and Christians alike, is also well known for its significant importance to the Bahá'ís, and serves as their spiritual and administrative center. The shrine of the Báb, the prophet-herald of the Bahá'í Faith, is situated at the heart of the Carmel slopes. The shrine is surrounded by spectacular terraced gardens sculptured into the mountainside. The shrine of the Báb, also known as the "golden dome," is one of Haifa's most distinctive symbols. The Haifa Tourist Board is situated at 48, Ben Gurion Avenue. Take the train (Haifa Center HoShmona) to Akko (aka Acre) which is about 30 minutes. Then take a 5 minute taxi ride to the Old City. Carmel (the Carmel Center) – a residential, entertainment and leisure area of Haifa. The renovated and revamped underground train comprises only 4 carriages which are fully air conditioned and modernized. It works according to the principle of lifts or elevators. The carriages move on a track and wheel system which is very close to that of an ordinary train. However, they are pulled along by means of a cable operated from the main Carmelit station, which is also where the main control room is located. You could take the Carmelit whose lower end is easily walkable from the cruise terminal to get to the top of the Bahá'í Gardens, and when you exit at the last stop, you'll have marvelous views over the city and nearby coast. Unlike other major cities in Israel, local buses (but not the Carmelit) run on Saturday and other Jewish holy days. However, they don't operate on Friday evenings. Haifa Has two main bus terminals where passengers can switch between inter-city buses and trains to the local routes operated by Egged bus company. Druze Villages. 30min by sherut or longer by bus to the top of Mt. Carmel. Galilee/Nazareth A organized excursion in recommended, due to time restraints. In Israel shopping malls are called 'canyons'. Haifa's mountainous location makes it quite unfriendly for the pedestrian, therefore shopping avenues are rare. The shops that are found in the city center offer a cheap and essential variety. On the other hand, Haifa has a well known reputation for its wide variety of malls and shopping centers such as the Kiryon, Kastra Center, Kanyon Haifa and 'Lev Hamifratz'. In addition, the 'Grand Kanyon' is considered to be the newest and biggest mall, including international brand names such as Armani, Lacoste, Benetton and Zara as well as local brands and a wide food court. Eating out in Israel is expensive especially if you dine at a sit down restaurant. You can enjoy any meal at any outdoor cafe, the food is always good and inexpensive. Sit down restaurant lunch can go for about $30 for lunch and $50 for dinner. Your best bet is to use credit cards, you usually get a better rate. Also, you can use American dollars, most places will take dollars. WiFi is free just outside the Duty Free Store at the cruise terminal.